In recent months, the Tax Foundation has been converting its historical publications library to PDF format, and posting them to our website. 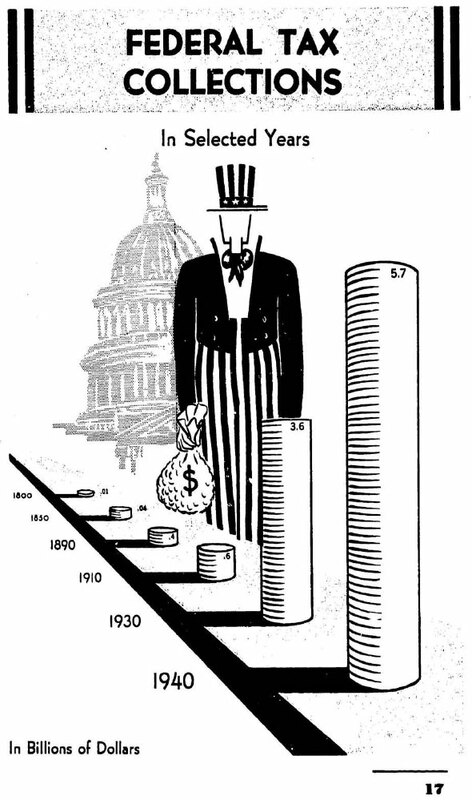 Because our archives date back to the late 1930s, they’re full of rich historical views on taxing and spending problems throughout the last century. Our latest addition to the website is a Tax Foundation classic: the first edition of our famous Facts & Figures on Government Finance book from 1941. The full book—which has been out of print for a half-century—is now available in downloadable PDF format. (Two later editions from 1942 and 1944 are also available). “Taxes may be considered as the prices we pay for government and governmental services. Taxes, however, differ from the prices we pay for other services or commodities. We have a greater degree of selectivity in the purchase of our average, everyday commodities—we can buy or not buy, as we see fit. As individuals we may or may not want certain governmental services; we may or may not receive the direct benefits of such services. Yet we are compelled to pay for them through taxes. “Under the democratic process to which we Americans strongly adhere, we have the services if a majority of persons so express themselves. Sometimes, the legislative interpretation of the majority’s wishes may be imperfect—yet we must accept the services and pay the price in taxes.